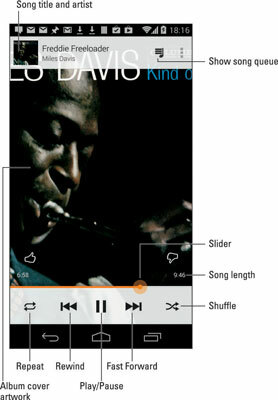 To listen to music on your Android phone, you first find a song in your music library. After you find the song, you touch its title. The song plays on another screen, similar to what’s shown here. While the song is playing, you’re free to do anything else with the phone. In fact, the song continues to play even when the phone is locked; a shortcut to the song, along with control icons, appears right on the lock screen along with information about the song. After the song has finished playing, the next song in the list plays. The next song doesn’t play if you have the Shuffle icon activated. In that case, the Play Music app randomly chooses another song from the same list. Who knows which one is next? This icon indicates that Shuffle is off; songs play one after another. This icon indicates that Shuffle is on; songs play in random order. This icon indicates that Repeat is off; songs don’t repeat. This icon indicates Repeat current song; the same song plays over and over. This icon indicates Repeat all songs; all songs in the list play over and over. To change settings, simply touch either the Shuffle or the Repeat icon. To stop the song from playing, touch the Pause icon. When music plays on the phone, a notification icon appears, similar to the one shown. Use this notification to quickly summon the Play Music app and pause the song or see which song is playing. The volume is set by using the Volume key on the side of the phone: Up is louder, down is quieter. Determining which song plays next depends on how you chose the song that’s playing. If you chose a song by artist, all songs from that artist play, one after the other. When you choose a song by album, that album plays. Choosing a song from the entire song list causes all songs in the phone to play. After the last song in the list plays, the phone stops playing songs — unless you have the Repeat option on, in which case the song or list plays again.